IRVINE, CA - March 11, 2013 - (RealEstateRama) -- Award-winning KTGY Group, Inc., Architecture and Planning, is pleased to announce that AMLI Residential has received City approval for AMLI Uptown Orange, a 334-unit eco-friendly apartment community located in the City of Orange, Calif. The 5.6-acre urban infill project will be built on the site of an existing DoubleTree Hotel parking lot and will include the construction of two new parking structures, one for the DoubleTree Hotel and one for the apartment community's residents and guests. 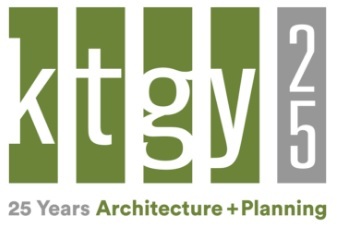 KTGY is the project's designer and architect. IRVINE, CA - January 30, 2013 - (RealEstateRama) -- Award-winning KTGY Group, Inc., Architecture and Planning, is pleased to announce that Carmel Partners of San Francisco has begun construction on Carmel Loft House, a contemporary, new, mixed-use development spanning two city blocks adjacent to the popular Plaza del Sol, off of South Frances Street and Olson Way in the heart of downtown Sunnyvale, Calif. The sustainable, urban infill development will consist of two buildings comprised of up to four stories of residential with 133 loft-style apartment homes and more than 6,000 square feet of ground floor retail space.